Prime Minister, Narendra Modi meeting the Prime Minister of Italy, Giuseppe Conte, at Hyderabad House, in New Delhi on October 30, 2018. The Prime Minister of Italy, H. E. Giuseppe Conte paid an Official Visit to India on 30 October 2018 at the invitation of the Prime Minister of India, H. E. Narendra Modi. A high level business delegation accompanied the Italian Prime Minister. 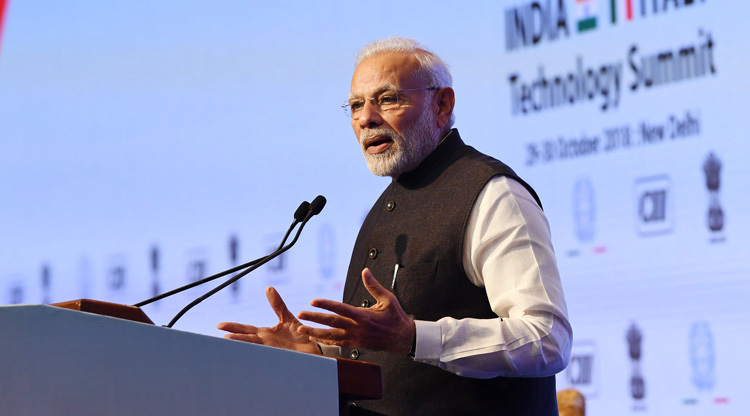 The two Leaders held bilateral talks and delivered valedictory speeches in the final session of the 2018 edition of the Tech Summit, which was co-hosted by the two countries. The Leaders reiterated that India and Italy ties are based on shared principles and values of democracy, freedom, rule of law, respect for human rights and territorial integrity of States. 3. They reaffirmed their commitment to strengthen mutual understanding and expand the range of bilateral engagement to promote peace, stability, economic progress and prosperity of the two countries. They took note of the year-long activities planned and undertaken by the two sides to commemorate the 70th Anniversary of the establishment of diplomatic relations. Recalling the 2005 Memorandum of Understanding on Political Cooperation between the Foreign Ministers of India and Italy, the two Leaders stressed the importance of regular high-level contacts to enhance bilateral cooperation. They welcomed the successful visit of India’s External Affairs Minister to Rome in June 2018. They welcomed the inter-parliamentary exchanges between the two vibrant democracies. They noted the successful visit by a goodwill parliamentary delegation from India to Rome from 15-17 October 2018. Both sides recalled the signing of a MoU between the Foreign Service Institutes of the two countries in October 2017 and noted with satisfaction that the first batch of Indian diplomats will be undergoing a training course in Rome under the aegis of the Italian Ministry of Foreign Affairs. The Leaders recognized the importance of regular defence exchanges between the two countries. 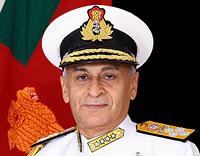 They took note of the 9th India-Italy Joint Defence Committee meeting which took place in Rome on 16th May 2018 and the recently concluded India-Italy 9th Military Cooperation Group meeting in Rome (11-12 October 2018) which saw the two sides agreeing to the bilateral cooperation plan for the year 2019. 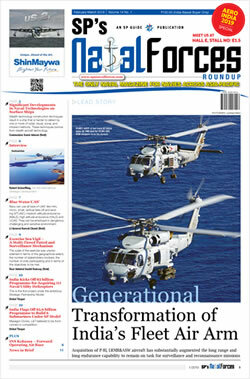 Both sides recognized the need to broad base defence ties and make them enduring and mutually beneficial. India invited Italian defence equipment manufacturing companies to invest in India under the Make-in-India initiative and to collaborate with Indian companies for design and construction of defence equipment. Underlining the importance of economic cooperation for strengthening the bilateral ties, the two sides agreed to convene the next session of the India-Italy Joint Commission on Economic Cooperation (JCEC) in India in 2019. Both sides agreed on the need for an institutional framework for a sustained dialogue to enhance the environment for ease of doing business in their respective countries and further facilitate and promote bilateral economic cooperation. To take this forward, the Leaders tasked the JCEC to work towards constituting a CEO Forum and setting up a Fast Track Mechanism to promote two-way investments, and resolve issues, if any, confronted by the businesses in each other’s country. 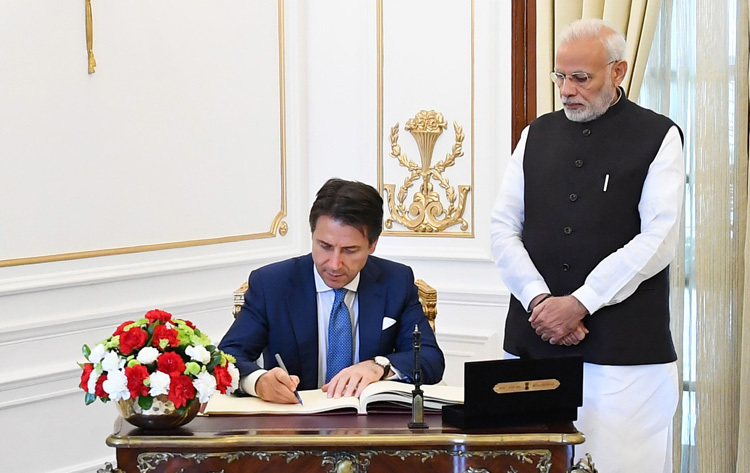 Prime Minister of Italy, Giuseppe Conte signing the visitors’ book, at Hyderabad House, in New Delhi on October 30, 2018. Prime Minister, Narendra Modi is also seen. 10.Recognizing the vast business opportunities in the food processing sector in India, the two sides called for greater collaboration. India invited Italy to explore investment opportunities in the entire food processing value chain particularly in food processing units, equipment manufacture, skill development, research and development and quality assurance. The Leaders welcomed the setting up of an India-Italy Joint Working Group on Food Processing that will be convened at a mutually convenient date. 11.Both sides took note of the establishment by the Indo Italian Chamber of Commerce, under the aegis of the Embassy of Italy in New Delhi, of an educational and vocational training hub in Mumbai called Minerva. Minerva will provide international standard education and vocational training for Indian students for placement in higher education and vocational training courses in Italy and India and support Indian students to get internships and placements in Indian and Italian companies. Recalling the Memorandum of Cooperation in the field of Renewable Energy signed between the Italian Ministry for the Environment and the Indian Ministry of New and Renewable Energy, the leaders took note that the relevant Joint Working Group on Renewable Energy had its first session in Delhi last February. A new session of the Joint Working group will convene in Rome in 2019 to take forward the Indo-Italian cooperation and collaboration in renewable energy. Both sides acknowledged the immense potential for bilateral cooperation in the railway sector particularly in the areas of safety, diagnostics, technology certification and capacity building. With a view to stepping up India-Italy cooperation in India’s infrastructure sector, particularly in the construction of roads, bridges, ports, subways etc., the Leaders encouraged Indian and Italian companies to explore partnerships under the PPP mode. Considering the fact that the development of infrastructure is a major driving force for the Indian economy and taking into account the growing interest of Italian companies to take part in Government of India’s endeavour to build world class infrastructure, both sides agreed to foster contacts between Italy’s Cassa Depositi e Prestiti (CDP) and India’s National Infrastructure Investment Fund (NIIF). Such a partnership would benefit from the presence of NIIF as a credible local partner and would leverage on Italian manufacturing and operational excellence. Cooperation between CDP and NIIF may entail the creation of Indo-Italian Joint Ventures in sectors of mutual interest. 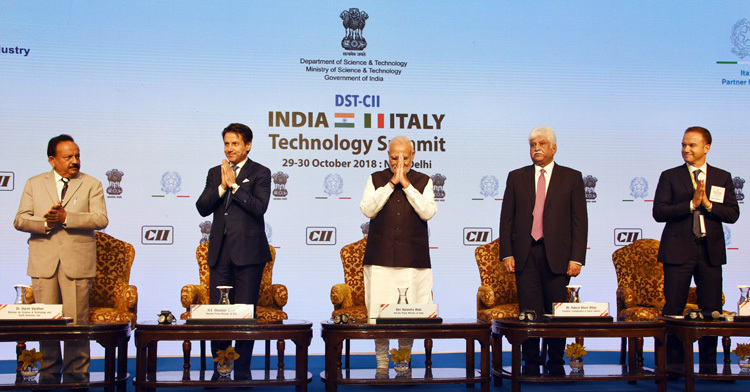 Prime Minister, Narendra Modi and the Prime Minister of Italy, Giuseppe Conte at the valedictory session of the India-Italy Technology Summit, in New Delhi on October 30, 2018. Union Minister for Science & Technology, Earth Sciences and Environment, Forest & Climate Change, Dr. Harsh Vardhan and other dignitaries are also seen. The Leaders expressed their commitment to strengthening the India-EU economic partnership and noted the on-going efforts of both sides to re-engage actively towards an early resumption of negotiations for a comprehensive, balanced and mutually beneficial India-EU Broad Based Trade and Investment Agreement (BTIA). The Leaders noted the successful organization of the Technology Summit in New Delhi on October 29 - 30, 2018. They also acknowledged that the deliberations at the Summit would contribute significantly in facilitating technology transfers, joint ventures, collaborative R&D programmes and in promoting market access between the two countries. Leaders hoped that this Technology Summit will strengthen our partnership for mutual gains based on our shared technological prowess and scientific knowledge. Leaders expressed satisfaction on the long-standing collaboration in science and technology involving some of the best scientific and academic institutions from the two countries in areas like Micro Electro Mechanical Systems (MEMS), Cognitive Neuroscience, Information and Communication Technologies, Environmental Sciences, Materials Sciences, Renewable Energy and protection of cultural heritage. The Leaders took note of the decision taken by the India-Italy Joint Science and Technology Committee to set up an Italy-India Platform for science and innovation for promoting and facilitating the establishment of Indo-Italian Centres of Excellence in selected areas of mutual strength such as cultural heritage preservation, renewable energy, life sciences, and geohazards. It was acknowledged that this initiative could not only link top universities, research institutes and industries of the two countries, but could also provide technological solutions to address common challenges. It was noted that Indian researchers are the third largest users of the Italian synchrotron facility - ELETTRA in Trieste. India also developed two sophisticated diffraction beam lines - ‘XRD2’ and ‘XPRESS’, for advanced material research in ELETTRA, which is available for use by the international scientific community in frontiers of material science and engineering. Recognizing Italy’s status as an international leader in the area of Design, the two sides agreed to explore the feasibility of collaborating in the fields of Life Style Accessories Design (LAD) with special focus on the leather sector, and Transportation & Automobile Design (TAD). The two sides reaffirmed their commitment to strengthen global non-proliferation efforts. Prime Minister Conte congratulated India on its admission to the Missile Technology Control Regime (MTCR), The Hague Code of Conduct, Wassenaar Arrangement, and the Australia Group. He reiterated Italy’s support to India’s intensified engagement with the Nuclear Suppliers’ Group (NSG) which strengthens global non-proliferation efforts. The Leaders agreed to launch the next phase of the bilateral India-Italy Industrial Research & Development Cooperation Program. This will enable industries, enterprises and research institutions of both countries to partner seamlessly in co-developing new products, proto types, processes by converting "know-how” into "show-how” in areas covering advanced materials; smart manufacturing; clean and green technologies and technologies for Cultural Heritage. In a world of increasing uncertainty, the leaders agreed to work together to support a rules-based international system that upholds the multilateral system, global peace and stability, based on the UN Charter, and promotes inclusive growth and the realization of Agenda 2030 for sustainable development in all parts of this inter-connected world. They welcomed the growing India-Italy convergence on contemporary global issues and agreed to enhance bilateral cooperation in multilateral fora. On climate change, the two leaders reaffirmed their strong commitment to the full and swift implementation of the Paris Agreement adopted to enhance the implementation of the UNFCCC, including its objectives, with the aim of strengthening the global response to the threat of climate change in the context of sustainable development and efforts to eradicate poverty, and being guided by all its principles. The two leaders strongly condemned terrorism in all its forms and manifestations. The leaders asserted that strong measures need to be taken against terrorists, terror organizations and all those who encourage, support and finance terrorism. They condemned all kinds of State support to terrorists including cross border terrorism and providing safe havens to terrorists and their network. The Leaders agreed to strengthen counter-terrorism cooperation through multilateral fora and called upon all UN member countries to effectively implement the UN Global Counter Terrorism Strategy, UNSC Resolution 1267 and other relevant UNSC resolutions relating to prevention and suppression of terrorism and terrorist financing. The Leaders also agreed to work together for implementation of The Hamburg G20 Leaders' Statement on Countering Terrorism, and to further cooperate in this regard at the upcoming Buenos Aires G20 Summit. The Indian side proposed to host the second India-Italy Joint Working Group on Combating Terrorism in New Delhi at a mutually convenient date in the first half of 2019. The Leaders acknowledged the important role that connectivity plays in promoting economic growth and people-to-people contacts in the 21st century. They underlined that connectivity initiatives must be based on internationally recognised norms and standards, good governance, rule of law, inclusiveness, openness, transparency and equality and must follow sound principles of fiscal, social and environmental sustainability. Keeping in perspective their future consecutive G20 Presidencies, the two sides agreed to coordinate their efforts to make their respective Presidencies productive and enduring. They agreed to work closely on their common priorities to develop initiatives aimed at promoting effective multilateralism, underpinned by principles of democracy, peace and fairness and to join efforts towards global governance to ensure fully dignified life conditions for all citizens, with no one left behind. The Leaders reiterated their commitment to improve the transparency and integrity of public and private sector through practical international cooperation and technical assistance, and agreed to continue to fully implement G20 Anti-Corruption mandates. The Leaders agreed on focusing their attention on the need to strengthen a free and rules-based system of international trade, aimed at promoting growth, employment and sustainable development goals and to ensure a level playing field. They confirmed the need to further strengthen, and reform the WTO to help it meet new challenges and to improve its transparency, monitoring, dispute settlement mechanism, and its rulemaking functions. They committed to ensure free and open trade on a level-playing field and fight all forms of protectionism, including protectionist unilateral measures and unfair trade practices. Leaders underlined the importance of implementing and enforcing obligations under the WTO by its members, including the ongoing work to implement its Trade Facilitation Agreement. India and Italy expressed satisfaction at the recent election to the Human Rights Council and noted with appreciation the tremendous support they received from countries. They also recognized the mutual support between the two countries. Both sides pledged to uphold the highest standards in the protection and promotion of human rights and fundamental freedoms, while contributing actively to the work and activities of the Council. 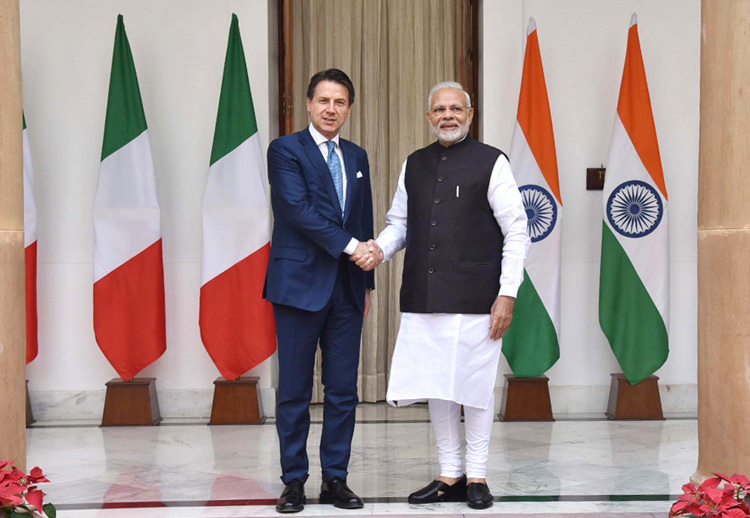 Prime Minister Conte thanked the Government and the people of India for their warm hospitality and extended an invitation to Prime Minister Modi to visit Italy at a mutually convenient date.